«©NCS» If you've ever had the inclination to don a battle-weary hockey mask or wear a wicked-looking clawed glove, your chance is here. Continuing the Horror Summer theme, Sega releases two props for anyone aspiring to take on the personas of Freddy of Nightmare on Elm Street fame or Jason Voorhees from the Friday the 13th movies. 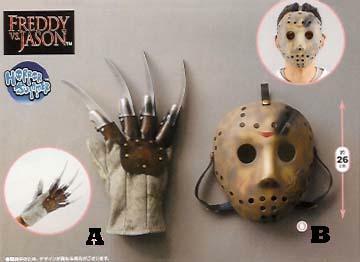 The claws look menacing but they're made of pliable plastic and are mounted onto a rugged gray glove that's for right-handed slashers. Sorry to all the lefties out there. The hockey mask measures 26cm (10.23") tall and is affixed to a wearer's noggin by two straps. Through-holes are machined into the front of the to allow for gas exchange so the wearer doesn't suffocate. The left side of the "cheek area" of the mask is scarred and weathered which is a nice little extra detail. 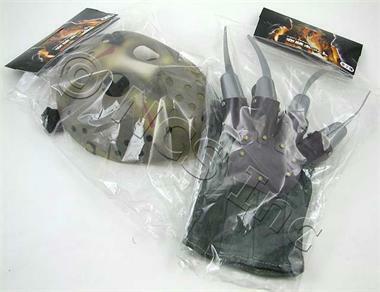 Gore-lovers can paint some extra red goo or maybe some chunky meat sauce onto the mask to give it additional authenticity.